Sometimes I forget about the fact that Mike & I grew up in such completely different cultures. I mean, there is a fairly large body of water standing between the US and the UK. It’s just easy to forget about all that when we speak the same language. Though Mike (and probably most Brits) would argue that we don’t speak English in the States – we speak American. After about two and a bit years living here I think I agree. I feel pretty proud of how far I’ve come with all that actually. When my friends from Arizona came to visit last week I had to act as interpreter a few times for them. Mike used to have to do that with me when I first moved here because I couldn’t quite follow all the accents (including his dad’s). Now the only time I need help is when we’re at a football match and there are thousands of people chanting all sorts of profanity en masse to the players on the field. It’s fantastic. That all being said, it shouldn’t have been a surprise to me when I first learned that peanut butter & jelly wasn’t really a thing here. In fact – you don’t call it jelly here because jelly in the UK = jello to an American. I suppose while I was throwing back peanut butter and jelly sandwiches Mike was busy eating pork pies and fish finger sandwiches. PB&J sandwiches were never anything I was particularly crazy about as a kid, but as an adult I find myself really craving one every now and then. I think it’s probably a combination of nostalgia + comfort, but they do really hit the spot for me. Also, you can’t go wrong with a salty & sweet combination. 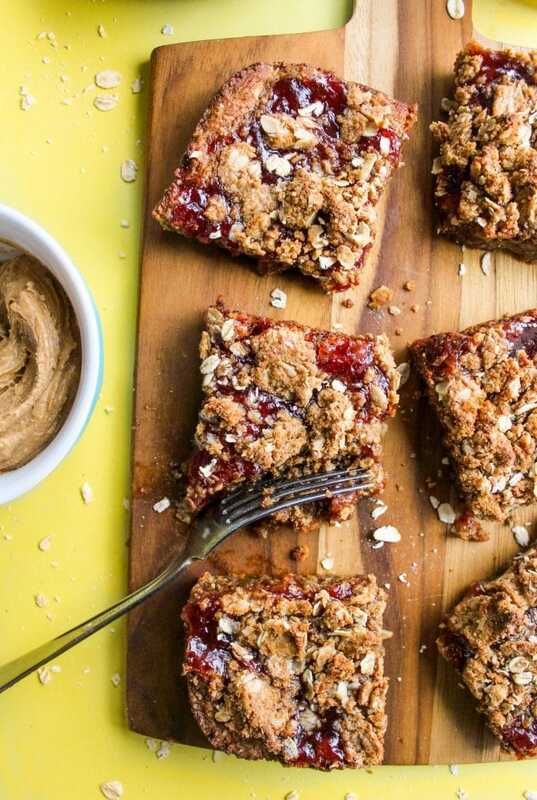 The base of these vegan peanut butter & jelly bars comes from my peanut butter oat bars recipe. It’s one of the first recipes I ever shared on here and it’s still one of my favourites/go-to’s for when I want something quick and easy. The original recipe actually calls for eggs, but I’ve since played around with the recipe and have found that using flax or chia eggs in places of the real eggs can be done without any noticeable difference. If you’re alright eating egg then feel free to use those instead. I just like including options for those with food allergies since we here at ASK know the pain of not being able to eat x,y or z. All in all this is a super simple recipe to make. 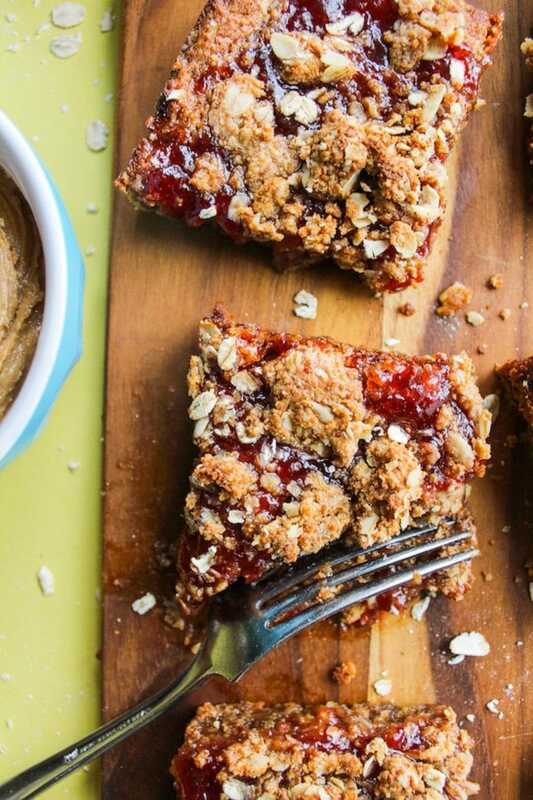 After you make and pre-bake your base you just need to slather a bit of jelly over the top and sprinkle over your crumb topping. Crumb toppings really make everything better. 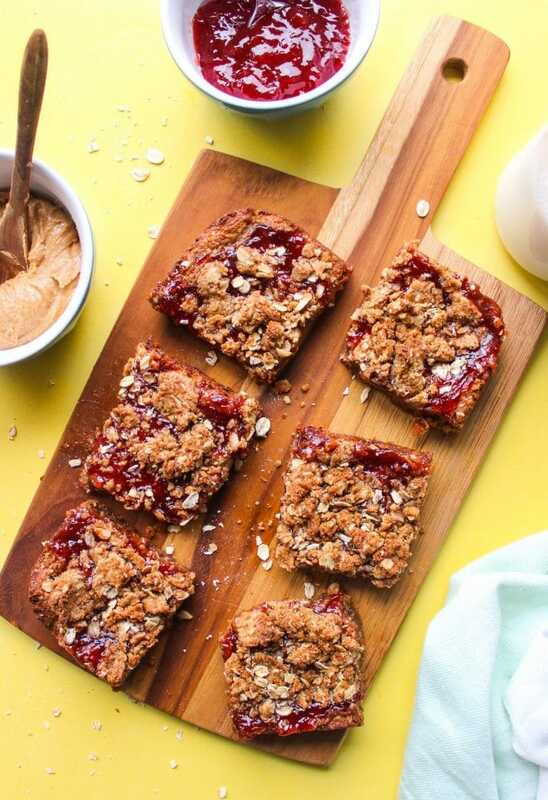 Don’t forget to #asaucykitchen on instagram if you try these Oatty Peanut Butter & Jelly Bars! I love seeing what you make with! You can also post your pictures to our facebook page! Preheat your oven to 350°F/180°C and line/grease an 8x8 inch square baking tin. In a medium sized mixing bowl add the peanut butter, flax eggs, sugar, and vanilla. Mix to combine. Stir in your baking powder , salt and oats until everything is evenly incorporated. Once everything is mixed together completely, dump and press the dough in to the lined/greased baking dish making sure it's evenly distributed. Bake it in the oven for 15 minutes. Take the peanut butter base out of the oven and spread the jelly evenly over the top. In the bowl you were using before, add the remaining topping ingredients (peanut butter, oats, and sugaand mix together until combined. Sprinkle the crumb topping over the top of the jelly mixture and then place the baking tin bake in the oven to bake for another 10 minutes. Once done, remove from the oven and let cool at least 10 minutes before cutting into a serving. To make flax egg: combine 2 tablespoons ground flax seed (or chia seeds) with 6 tablespoons cold water. Whisk until combined and place in the fridge for at least 10 minutes. When the 'egg' has thickened and gelled up it's ready to use. Thank you for the info on how to substitute chia or flax for eggs! I’ve had a very hard time finding instructions as straightforward as yours! It’s a good thing you call them bars — your father-in-law would be even more confused if you had to explain cookies and biscuits! Ha! So true! And then I’d have to explain American biscuits vs British biscuits – so many things to explain! Glad you found it helpful! I used to be in the same boat. 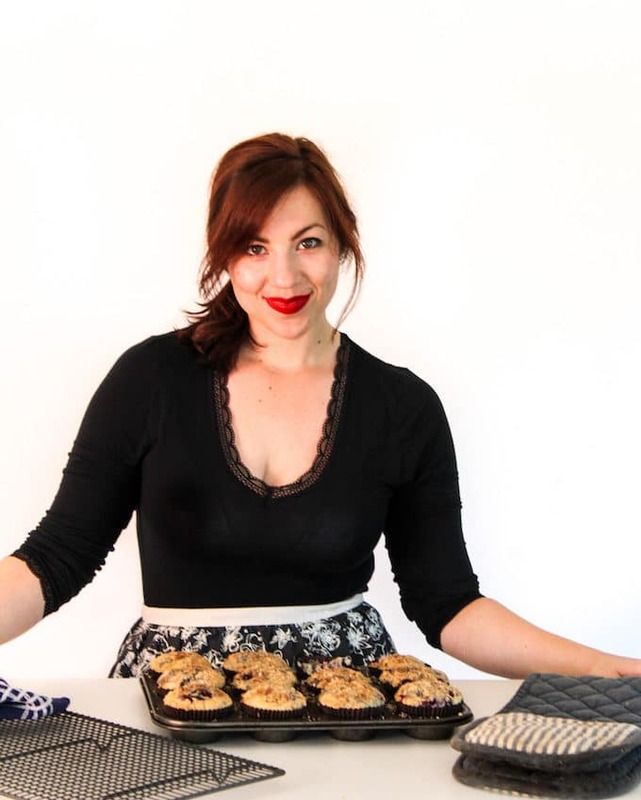 I could never remember how to make it exactly and no one ever seemed to explain it in the recipe – drove me nuts! That jelly/Jello thing is too funny! These bars look so delicious. Can’t wait to try them out with a cup of coffee. Yum! Thanks, Lucy! Hope you like them!